Here's a scientific study about the best way to save on a brown bag lunch. The following post comes from Len Penzo at partner site LenPenzo.com. Last week, I got a notice in the mail announcing that my kids’ school lunch price will increase by about 10 percent this year to $2.25. Despite the increase, I’m sure many busy parents struggling to make ends meet think that’s still a bargain for lunch. It’s not. In fact, with the new school year quickly approaching, one of the easiest ways to save money is to bypass the school cafeteria and make your kids a brown bag lunch at home. Whether it’s for school or the office, brown-bagging a sandwich, piece of fruit, and carrot sticks (or even a serving of chips) will almost always be less expensive than buying lunch somewhere else. That being said, some sandwiches are obviously going to be more economical than others. After all, who can forget celebrity chef Martin Blunos’ $168 cheese sarnie? 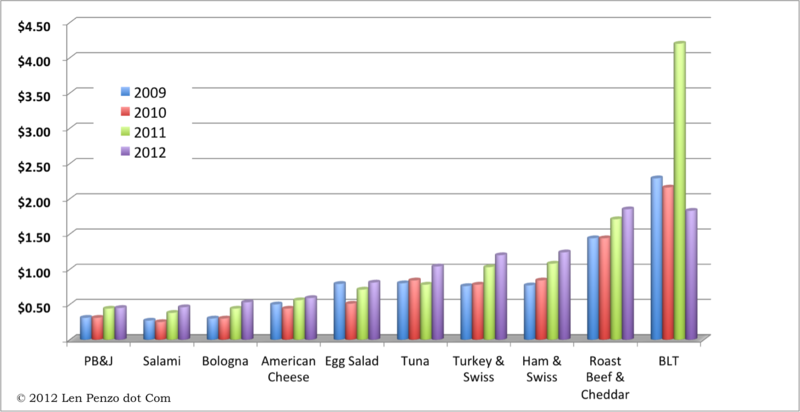 Thankfully, the results of my fourth annual brown bag sandwich price survey show that most folks will end up spending far less than that in 2012 – even for the most expensive sandwich on the list. 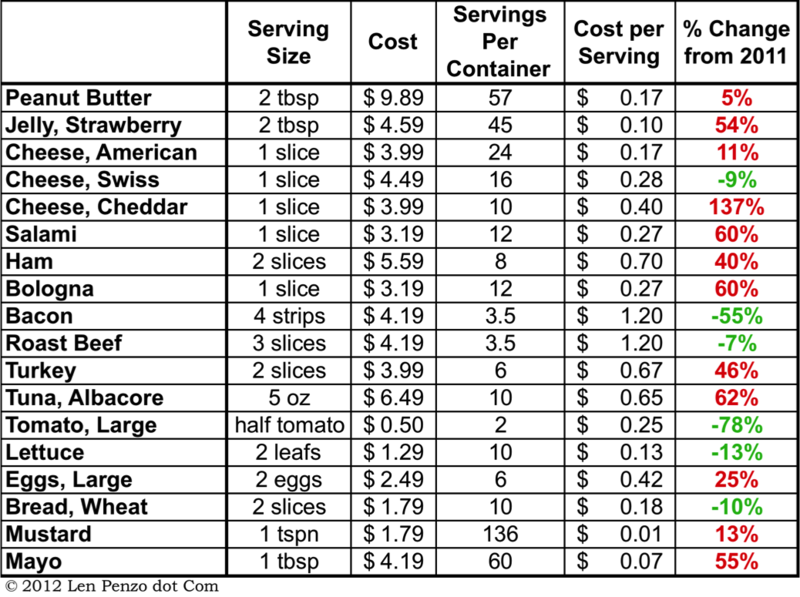 As in my past sandwich surveys, for consistency in determining prices of the individual sandwich ingredients, I only selected items with the cheapest per-unit costs, regardless of brand. To keep it simple, I also assumed all sandwiches would be made with wheat bread. With that data in hand, and using my handy spreadsheet, it was no effort at all to determine the most economical sandwiches. Now I realize that some people don’t use any spreads at all. I also understand that some folks enjoy two or three slices of bologna. And I know lettuce and tomato can be placed on sandwiches other than a BLT. If you make your sandwiches differently, you can simply look at my shopping survey numbers in the top figure and adjust the sandwich costs in the bottom chart accordingly. You can often save upwards of 40 percent by avoiding name brands and buying the store-brand products instead. As my blind taste tests have proven, sometimes it’s tough to tell the difference. Try cooking your own ham or turkey and slicing it yourself to save even more money. Likewise, it’s also cheaper to buy block cheese and slice it at home. If you’re like me and love to put tomatoes on a sandwich, grow your own. You’ll save a bundle. Best of all, they taste much better than anything you can buy from your grocer. For the first time, peanut butter & jelly holds the honor of being the most economical sandwich in the survey, finally knocking the perennial champion, salami, off the top spot. The signs of inflation that began to appear in 2011 have clearly accelerated, and many of the latest increases are rather disturbing. For instance, ham, salami, bologna, turkey, tuna, mayonnaise, and jelly prices all increased by 40 percent or more since the last survey – and the price of cheddar cheese increased an incredible 137 percent! With that in mind, it should be no surprise that prices for nine of the 10 surveyed sandwiches saw increases this year. Somewhat ironically, last year’s most expensive sandwich, the BLT, was the only sandwich in the survey to see an overall price decline this year, thanks to significant drops in the price of tomatoes and bacon. In fact, the BLT is the only sandwich in the survey that’s less expensive today than it was in 2009. Last month, the large spike in bologna prices temporarily made that popular lunch meat more expensive than lobster, thanks to a glut of the tasty crustacean. But don’t let that scare you. A bologna sandwich is still one of the most economical sandwiches on the lunch menu. Of course, that assumes you’re making the sandwiches – not Martin Blunos.